When Steyning People think of smuggling the person they are most likely to call to mind is William Cowerson. He was the one – a Steyning master mason – who, when in command of a large gang of some 200 smugglers who were running 300 tubs of brandy up the Steyne in Worthing, was shot by excise men and killed. He must have been a big and also a respected man because they dug his grave 7’ 6” long and 7’ deep and, at his passing, tolled the bell for four hours – 'a merry peal' said a local newspaper. But smugglers did not always acquire Cowerson’s ‘heroic’ stature. Thirty years before Cowerson was killed a Steyning man called Holden was charged and found guilty of assaulting a Revenue Officer, whilst engaged in ‘running’ smuggled goods. A witness statement at his trial, in 1801, explained the events leading to his conviction. 'Samuel Jones said that, when he was Supervisor of Excise at Steyning, he was returning home between ten and eleven one night in company with John Orchard, another officer, when he heard the noise of a number of horses. He stopped in a lane and Orchard went over into a field. 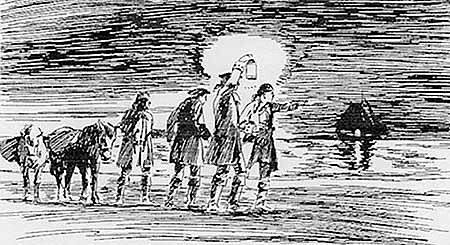 A party of smugglers, consisting of 16 or so men, came up the lane; three of the men were light (that is to say their horses were not carrying any goods), and the horses of the others appeared to have tubs slung over them... the three light men advanced towards the witness. One of these men, whose name was Meeting, exclaimed 'D – n you, what do you do here'. Thinking he recognized one of the men he said 'Mr. Chandler is that you?' Whereupon Meeting and Holden and Chandler struck him with very heavy sticks and almost knocked him off his horse. His arm was beat as black as his hat. As he was retreating he received a very severe blow on the back of his head and he almost fell; however, he spurred his horse and got away. It was owing to the violent treatment he received that he was prevented from making the seizure.' Interesting that his colleague, Orchard, does not get a mention after his craven escape into a field. Although the idea of smuggling is invariably associated with bringing goods into the country to avoid paying tax or duties, the trade could also go in the other direction. Treasury documents, of 1702, describe how John Johnson of Steyning, a tanner, claimed 'relief from the fine of £415 imposed on him last Easter term (by the sole evidence of Christopher Turner) for transporting wool to France'. The rewards, it would seem, could be enormous. A Treasury warrant of 1704 stated that Charles Goreing claimed a reward for giving information to 'Mr. Wade, Collector for the Customs Commissioners at Arundel port' leading to the 'surprising of smugglers at Steyning whereby he seized silks to the value of £4,000'. We can actually get some idea of how much silk might have been involved in this haul by making a comparison with valuation of the fabrics sold by Samuel Lucke in 1706. His shop was where the post office is now and his most expensive silk was valued at 4 shillings per ell. However to work out from this how many yards of silk might have been involved is not straightforward: we don’t know whether the valuation referred to the Flemish ell of 27 inches or the English ell of 45 inches and the width of a piece of silk and its quality affected the valuation. So, although we cannot be sure how much silk equated to £4,000, it is quite likely to have been more than 1,000 yards. It would also be interesting to discover how much Cowerson and his men hoped to make from the sale of his 300 tubs of brandy. Using a similar calculation, we reckon that it could have been as much as £1000.